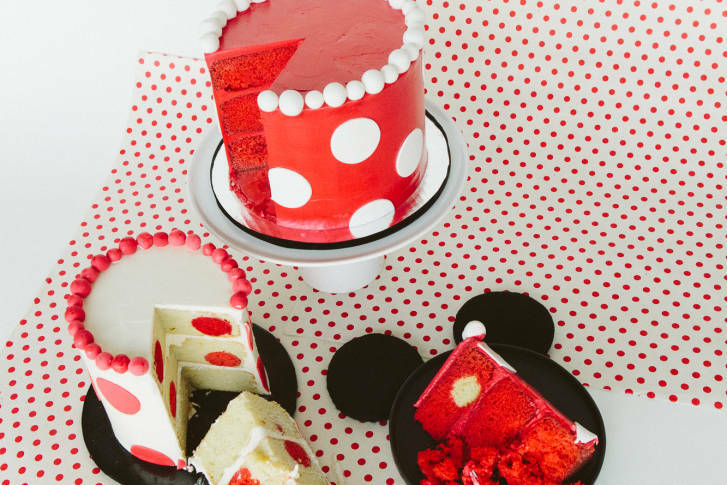 Polka Dots are always in fashion….. for Disney fans anyway! Gently tap bottom of cake pans against counter surface to remove excess gaps between batter and cake dots. To make the cake dots, prepare vanilla cake batter according to your favorite recipe. Fill cake pop molds with batter and secure top of mold. Set aside leftover batter if you’d like to make another cake in reverse colors. Bake cake dots for 15-20, or according to recipe instructions. Remove from oven and allow to cool for 5 minutes before removing dots from mold. Grease cake pans and line bottom with parchment paper. Prepare red velvet cake batter according to your favorite recipe. Place cooled 4 vanilla cake dots in each cake pan. Divide batter between cake pans and spread evenly over cake dots. Batter should cover dots at least half way. Bake cake according to your recipe instructions. Allow cake to cool before carefully removing from pan. To assemble cake, place a dollop of frosting in the center of cake board. Place first layer of cake on top. Smooth a layer of frosting evenly over cake. Add second cake layer and repeat the process until all cake layers are stacked. Once assembled, crumb coat entire cake with a thin layer of frosting. Add final layer of frosting to cake. Smooth the frosting as much as possible, starting with the sides and finishing with the top of the cake. To make decorative dots, roll out your white gum paste on a surface dusted lightly with cornstarch or powdered sugar. Using round cookie cutter, cut rounds and place directly on the sides of the cake in an offset pattern. To make decorative ball toppers, roll white gum paste into a large ball shape. On dusted surface, roll out gum paste ball into a long rope about 1 inch thick. Cut ½ to 1 inch pieces of your rope and roll each piece into a smaller ball. Place balls directly onto the top rim of your cake until the entire cake edge is covered.